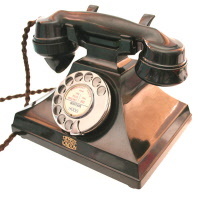 This is a wonderful family run web site selling vintage telephones from all periods. Take a look to see the time and trouble spent to show the quality of their restorations. As you will see the very best pictures are taken of each Antique Telephone along with an extensive description that not only helps with knowing exactly what you will receive but also will point out any minor imperfections. Please note that some dealers are selling telephones with the internals cut out and wired up very crudely and so will not work to a good standard. Antique Telephones do not do this and will always make sure any telephone sold is wired up to work to the best standards possible.